Frimet's blog appears online on the Times of Israel website today. Please consider sharing the link with your friends. Today is my daughter Malki’s birthday. As in each of the past fifteen years, it will be marked with a visit to her grave. The one other time we go there is to mark the anniversary of the day she was murdered. I have always insisted on using that word, jarring though it is. I never say that Malki died. Or that she was killed or perished or passed away. It is significant to remember that she was snatched from us in that manner. And it is crucial to specify that her murderer was not your garden-variety blood-thirsty psychopath, but rather an Islamist terrorist. Nowadays, my husband and I feel especially compelled to publicize that last point. We and the rest of the world must be reminded – and in some cases convinced — of how Jewish terror victims are one with terror victims of other nationalities. Sadly, this is not a given. Many, even some Jews, view our victims as the collateral damage of a territorial conflict only vaguely connected to the terror threat confronting the rest of the world. The inference, of course, is that unlike the victims in Paris last week, my child’s murder had an explanation, a justification. Implying that as Jews residing in Israel, we invited our tragedy upon ourselves. Unfortunately, the task of rectifying this abominable misconception has fallen to the victims themselves. We cannot rely on our prime minister to spread this message. It would be hard for him to assert that Israel is suffering from the very same terror plaguing the world. That’s because, on October 18, 2011, he himself underlined the idea that ours is a milder version of terrorism. On that day, he freed hundreds of self-confessed, unrepentant, convicted murderers in a travesty of justice that no other free world leader had previously committed, has committed since or will ever commit in the future. That day, the chasm between himself and other world leaders confronted by terrorism grew exponentially. It is left to us, Israel’s terror victim families. We are among those who publicly decried the decision in 2011 to ride roughshod over basic notions of justice. We need to demonstrate to the world that our children were as precious, as innocent and as randomly targeted as the victims of ISIS terrorism. We carry the burden of proving that Palestinian terrorists are as indiscriminately barbaric and hateful as the beheaders of journalists and the rapists of Yazidi women. A mere glance at the video [here] of Malki’s murderer, Ahlam Tamimi, as she rejoices in her prison cell to hear that she murdered not “merely” three, but eight children along with her eight other victims, makes that abundantly clear. In interviews she gave to Arab journalists after being released in the Shalit Deal, Tamimi gleefully boasts of her accomplishment. Her blood-thirstiness is palpable. 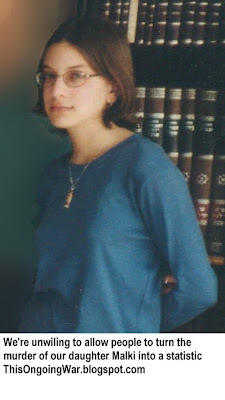 Today, but for the evil of Islamic terrorism, our Malki would have been a thirty year old woman, probably a loving wife and mother and — as always — a dear daughter and sister. Instead, her murderer is free, married, a celebrity with a high-profile television program of her own, freely inciting other Muslims to follow her example. 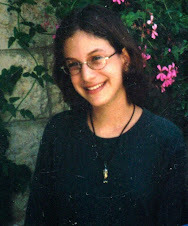 And she is not the only one of the Shalit Deal releasees who returned to terrorism. While Israeli officials refuse to divulge the precise number, Palestinian sources reported in August 2015 that at least 63 of them had been rearrested by Israel up at that time. The Shalit Deal is clearly a fiasco that our government is anxious to bury. Instead, we are burying the victims of that deal. Today on Malki’s birthday, please help us in our quest to educate others about terrorism in Israel. Remember her, remember her purity and kindness and remember Ahlam Tamimi, the Islamic terrorist who murdered her. May you be comforted among the other mourners of Israel and Jerusalem. The goodness of Malki's life comes out of your writings. May you lead all of us to an Israel where terrorism does not exist.